Panthers promoter Ged Rathbone has spoken of the financial implications of a series of postponements. The city club saw three recent SGB Championship meetings called off before a KO Cup quarter-final first leg at Scunthorpe was abandoned last Sunday. Panthers’ last two scheduled home fixtures - against Berwick and Workington - both fell victim to the weather while a visit to Glasgow suffered the same fate. And the cup clash at Scunthorpe was then brought to a halt after only five races had been completed when the heavens opened at the Eddie Wright Raceway. Rathbone said: “The club is probably £8,000 out of pocket in total. The two home meetings we’ve lost have been particularly costly. “As both were called off late on, we had to pay our rental fee for the use of our track as well as the travelling expenses of the two away teams. “We also paid for hotel accommodation in Scotland on the Friday night after we rode at Edinburgh due to being at Glasgow the next day, but that meeting was then rained off. “And the abandonment at Scunthorpe also costs us money. We have to pay our riders for the 11 points we scored in the five races that were completed, and also for their travel. “We always budget cautiously as we know the weather plays such a big part in this sport, but I certainly hope we’ve seen the last of the rain for this season. Panthers were 19-11 down when the action was halted at Scunthorpe last Sunday. Attempts from the home club to restore the track to a raceable condition proved unsuccessful with referee Peter Clarke eventually calling the contest off. It meant more frustration for major signing Chris Harris, who had seen his first two scheduled appearances for the club - at Glasgow and at home to Workington - called off. He did at least manage two rides at Scunthorpe, which both ended in second places. A new date for the re-staging of the meeting is still to be agreed. 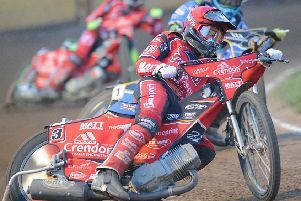 The club’s meet again at the East of England Arena on Friday, June 16 in what will now be the first leg of the quarter-final clash.